There's a smooth vibe breaking through Boston's evening air. 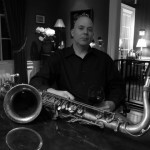 It's the unmistakable sound of James Calandrella's Saxophone. Musical styles of funk, classic jazz, blues and dynamic free form - James has sold his soul for his musical passion. Share his passion - see/hear him perform live at his next show.